Bulgarian champions Ludogorets say they could quit the league after claiming that referees are favouring title rivals Levski Sofia. On Saturday, Levski were losing 1-0 against Litex Lovech but the game was abandoned when Litex players walked off the pitch in protest after a second red card and a penalty against them. Levski are set to be handed a 3-0 win. 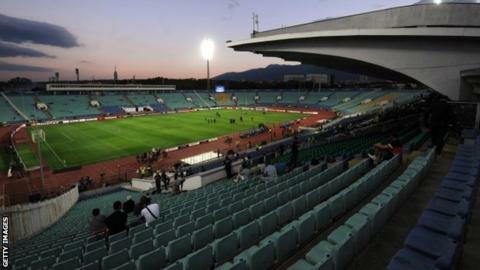 "We'll probably quit the championship if such precedents in favour of Levski continue," said Ludogorets' owner. Kiril Domuschiev took over Ludogorets in 2010, immediately leading them to the second-tier title and they have won all four Bulgarian championships since then - their only four seasons in the top flight. They lead Levski by three points, although they will be level at the top if the Bulgarian league do give Sofia the win. Domuschiev added: "Why should we spend our money, allowing teams who have neither the necessary skills nor the necessary class to win the title with such an approach?" On Saturday, Litex sporting manager Stoycho Stoilov said of his decision to take his players off the pitch: "There was a huge difference in the referee's decisions. I've never seen something like this in football. "This is a farce, an insult to all Litex supporters and all football fans. It was the peak of the absurd situation of football in Bulgaria."